Perfect Snorkel and Diving, Right Off the Beach! 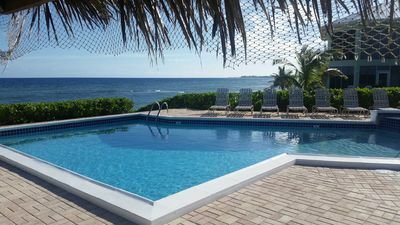 Presenting the Vista Blue Oceanfront Villa, the North Side of Cayman! 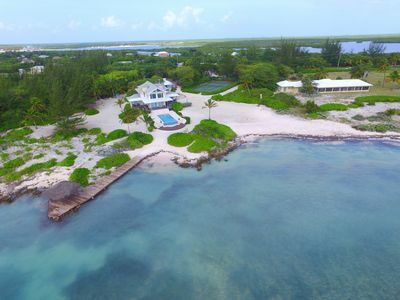 A modern, tropical island style private villa situated on nearly 2 acres of land in quiet, laid back location Bay on Grand Cayman's North side. Vista Blue sits back 1,000 feet from the already sleepy Old Robin Road, offering guests privacy and a beautiful quiet setting to relax, rejuvenate and enjoy! This spacious 3 bedroom, 2 bath villa home is designed to comfortably sleep up to 6 persons. 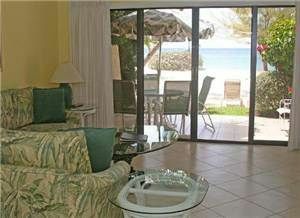 The master bedroom is direct oceanfront with a King bed, work desk and private en suite bathroom and walk in shower. The 2nd guest bedroom is also direct oceanfront with a queen bed, and the 3rd guest bedroom is equipped with a queen bed. The 2nd and 3rd bedroom share a full bath with walk in shower. You have plenty of room to spread out and relax in the large living area and adjoining sunken den sporting a 55" LCD Flat Panel HDTV with DVD and Roku. 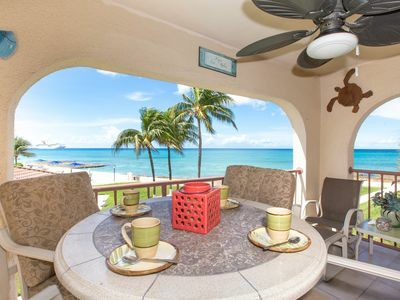 Off of the den is the oceanfront dining room accented with a beautiful full coral rock wall, with circular glass dining room table with seating for 6. There is also a separate breakfast dining area with teak table and chairs that seats 6 right off the kitchen. The open and spacious fully equipped kitchen has everything you need to prepare breakfast, simple light snacks, lunches, up to full formal meals. The kitchen includes dual sinks, dishwasher, refrigerator/freezer with ice maker, microwave oven, full size oven, 4 burner ceramic cooking top, blender and Presto Cool Daddy Deep Fryer. Grill out oceanfront style on the gas BBQ grill! 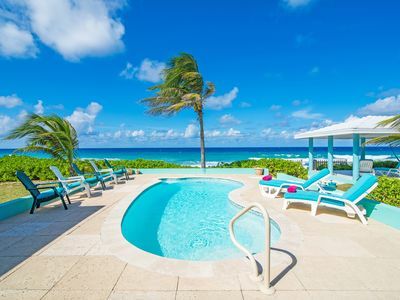 The villa is fully equipped with all linens, bath towels and beach towels. You also have access to full size washer and dryer in the garage. 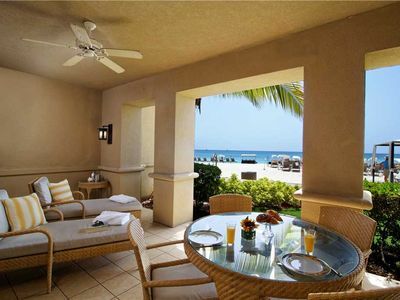 Coming off the dining room is a large screened in patio directly facing the Caribbean Sea. 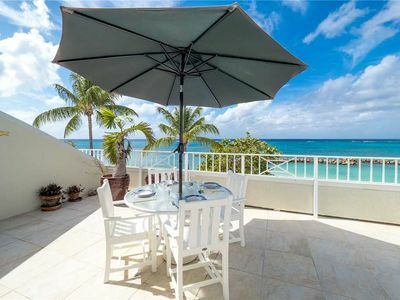 It's equipped with table and chairs to relax and take in the views and breezes. 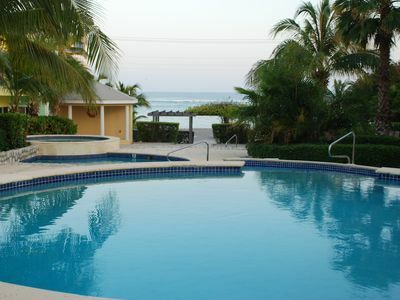 Step out of the screened patio, onto the large pool deck and step into your own private oceanfront freshwater pool. Then, a few steps over is the oceanfront gazebo with twin hammocks and lounge chairs to totally chill out. 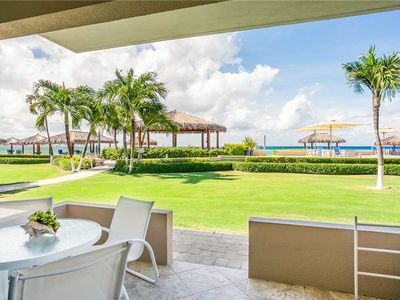 Blue Vista is surrounded by lush tropical landscaping, fauna, flora and swaying palm trees with spectacular 180 degree oceanfront views of the multi-hued blue Caribbean Sea, and the stunning North side shore. Blue Vista is a very comfortable 3,000 sq. 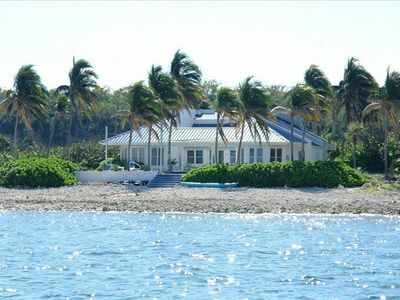 ft single story home directly on the Caribbean. 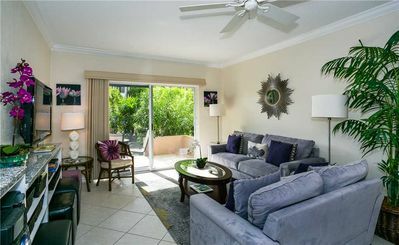 It featured high vaulted ceilings, ceramic tile flooring, ceiling fans throughout, high speed Wifi, central AC throughout the main living areas and private AC splits in each of the bedrooms. 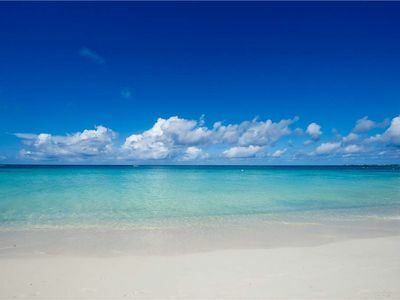 Blue Vista has a beautiful white sand beach that adjoins the extended beach that extends for miles along the North side. It's great for shelling, finding sea beans and searching for the occasional beach glass that has been tumbled and polished by the sea. 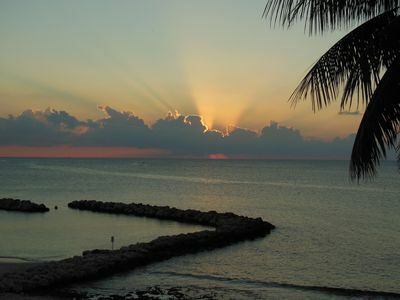 The coastline has Ironshore, which is a natural Cayman rock formation which then leads out into the sea. There is a concrete pad where you can access the ocean directly on your beach. You can also access the ocean from a unique shallow sandy cove that has natural swim thru cut in the iron shore. 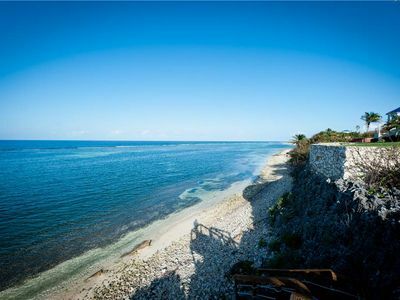 Right off the beach is outstanding coral reefs in 2-3 feet of water, sporting a wide variety of tropical fish. 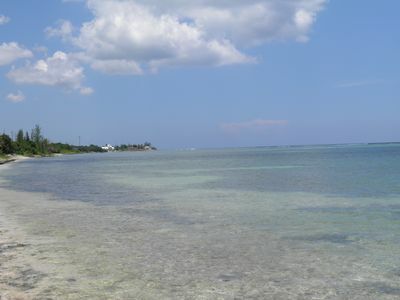 You may also see tarpon, turtles, squid and other interesting sea life as you snorkel this pristine underwater area. 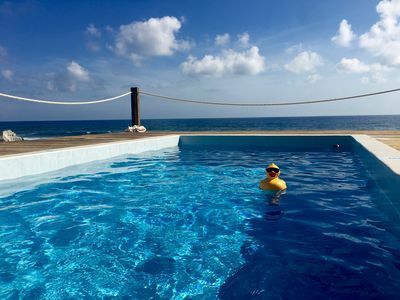 Perfect Snorkel and Dive location! Your on-island property manager lives nearby, and will be available to provide you with an orientation upon your arrival and assist you with anything during your stay. 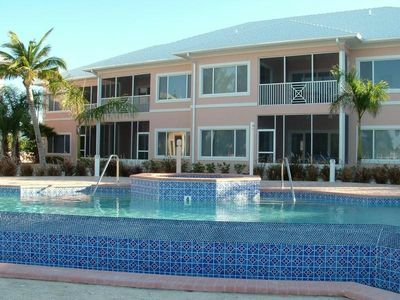 You are 30 minutes from the Owner Roberts international airport and 7 Mile Beach. 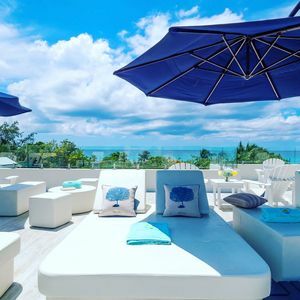 Nearby attractions include Rum Point, the Botanical Gardens, Crystal Caves and Red Sail Sports which offers snorkel trips to Stingray City, jet ski, SUP, kayak and paddle boat rentals. 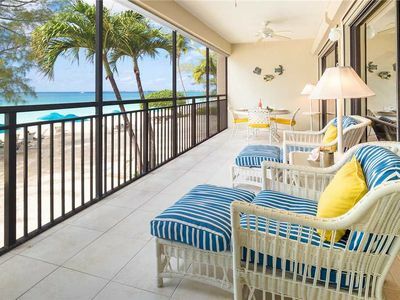 Stylish & Relaxed, Original Oceanfront Beach House - "The Bach"